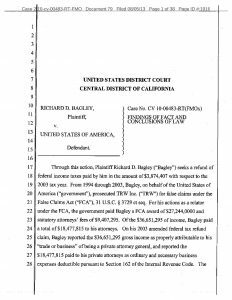 Bagley v. United States – Federal District Court trial of a multimillion-dollar refund action involving first-impression issue of whether a qui tam relator’s prosecution of an action under the False Claims Act could constitute a trade-or-business activity. This case is often cited for the “origin of the claim” doctrine, which is used to determine the character of income, losses, expenses or deductions resulting from a lawsuit or litigation. Reported in 963 F. Supp. 2d 982 (C.D. Cal. 2013); 112 A.F.T.R.2d 5166; 2013-2 U.S. Tax Cas. (CCH) P50,462; 2013 U.S. Dist. LEXIS 109801.